First of all, I want to point out that the "J" in JUG stands for "JVM Language" rather than "Java" these days. This event is for developer user groups focused on any of the plethora of programming languages now supported on the JVM. 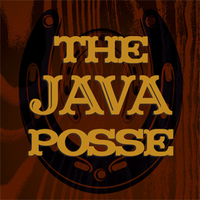 Having said that, we have pretty much every "Java" user group in the bay area participating in this event already. The capacity of the Oracle Conference Center in Redwood City is 450 and there is no reason we can not fill it to capacity on May 12th. Please help us to make this the biggest JUG gathering ever here in the bay area by blogging, tweeting and emailing this out to everyone. Contest runs from 6pm PST (start of the Pre-Chirp Party) on April 13 through 6pm PST on April 15th when the Chirp Hack Day ends. 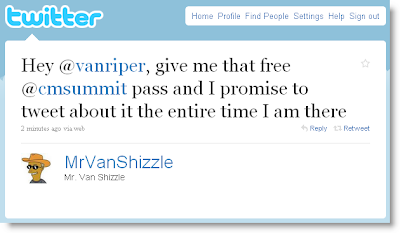 To participate in that time window, simply send a tweet referencing @vanriper and @cmsummit along with why you deserve a free ticket to CM Summit in 140 characters or less. The winner will be announced via my twitter feed at approximately 9pm on April 15th. 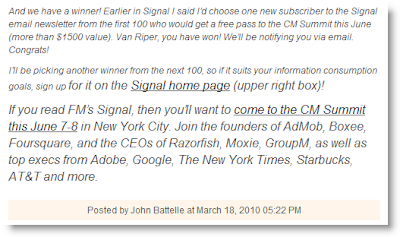 The winner will need to follow me and I'll follow them back on Twitter so that I can direct message to them the CM Summit free pass registration information. Finally, multiple tweets from the same account are more likely to hurt than help your chances. In fact, repeating the same or similar tweets repeatedly will be grounds for disqualification. I won't be randomly picking one tweet from the twitter search results anyway. So, additional tweets will not improve your odds of winning. P.S. 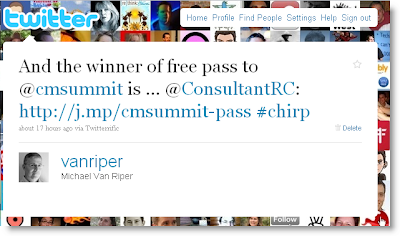 Congratulations to @ConsultantRC (Raul Colon) for winning the free pass to CM Summit.